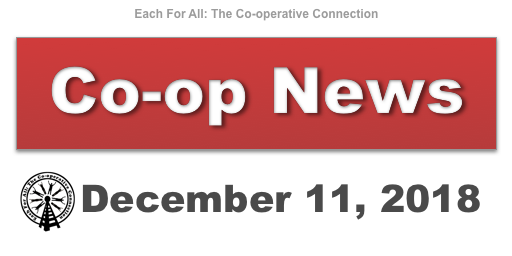 Federated Co-operatives Limited CEO Scott Banda reported an earnings drop of 16.4 per cent. FCL is the company with the iconic red chevron Co-op signs. It’s owned by 203 retail co-operatives across western Canada. This includes Otter Co-op in the Fraser Valley. Banda attributed the decline to a reduction on their crude oil business. FCL gets about 60% of their revenue from oil. Other FCL business segments like crop supplies, feed, and food had moderate gains. A subsidiary of VanCity Credit Union is providing $1 million in financing for the development of green bonds from Montreal based CoPower Inc. VanCity Capital Corporation will allow the loans to clean energy projects. The loans will be sold as bonds to Canadians. Created by the Trico Charitable Foundation in 2011, the biennial Social EnterPrize celebrates and advances leadership and excellence in social entrepreneurship in Canada. London Brewing Co-operative opened its doors to the public this past Saturday in funky old factory space in the southwestern Ontario city. Judging by the large crowd that lined up for draft or to buy one of the six beers made on site, there is a lot of appetite for local organic beer and local organic growth. 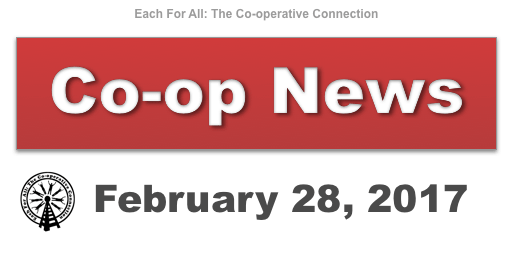 Are you an East End Food Co-op member? This coming Saturday March 4th is customer appreciation day. Get 10% off everything except sales items. It’s a crowd founding dinner of soup and salad where you vote for your favourite group. It’s a minimum $10 donation at the door and the winning group takes all.